Well, it hasn’t been quite as long since I blogged as I thought: only about five months (if you’re counting). But it feels like forever, and I’ve missed it! The fall was very hectic for me, and (for those of you who don’t know) I spent about five weeks in December and January volunteering at an orphanage in Uganda…during which time I did not really sew at all (of course), although I did crochet and knit every day with the kids and mended more clothing than I will for the rest of my life! Kids really love crochet–who knew? I left my apartment with about a dozen sets of knitting needles, three crochet hooks, and a suitcase full of yarn, and all of it was gone within three days. I had to troll through the markets of Kampala in search of more supplies for the kids, eventually coming up with only five more crochet hooks and four skeins of white and brown yarn. Not too exciting, but they loved it anyway. You can see more pictures of my trip here if you’re interested! The one thing I forgot was probably one of the most important things to remember: the battery charger for my camera. I had only one battery bar in the camera when I left, and I made it last as long as I could…which wasn’t long at all, but I did capture a few good images. So anyway, back to normal life I went at the end of January. I couldn’t even look at my sewing machine when I came back. I felt uncreative and unproductive, and I was out of good ideas for quilts. I was completely uninspired. I realized that blogging had actually helped me stay productive and inspired, even if obsessively reading blogs didn’t. So I trimmed my reader down to a few favorites, as well as the blogs of my good friends, and started to get back into the swing of it. I used only scraps for this one. There is a wide range of neutrals in many different shades and fabrics. 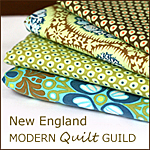 The lightest value is Kona Bone, and the darkest is Essex Linen in Putty (I think…I last used that fabric quite a while ago, in one of my first quilt projects). I wish I knew what Kona colors I used, but I don’t. I need one of those color cards desperately! Anyway, I moved in September into a place that has made it much more difficult for me to photograph my quilts. Yall may have noticed that I used to take pictures in the big park that was right behind my apartment building…now, there is nothing behind me but an area where people bring their dogs to go to the bathroom and a storage area for the garbage bins, so I am going to have to get creative! That was a major reason I stopped blogging, but now I really regret not taking pictures of some quilts I made and loved. The quilting on one of them was so intensive that it actually broke my machine, and yet I have no photographic record of it! I’m also thinking of moving to a self-hosted blogging platform so I have more control over the appearance and layout of my blog (and I do want a new blog name), but it’s actually much more complicated than I anticipated. For those of you who do that…do you like it better? Are you happy you chose it over a traditional blog platform? I’d love to hear your thoughts! Monet, I have missed your blogging! I’m so glad you’re back! Don’t worry, we all get in those creative funks, at least I do, where I just don’t feel creative and have no interest in quilting. Then it comes back and all is good again:) But wow, you went to Uganda?! I looked at your Flikr photos – just gorgeous, every one of them. What an amazing experience! Monet you’re alive! Wow have you been busy but it sounds like mostly in a good way! I look forward to more of your craftiness! I had switched to wordpress for awhile but it was driving me nuts because you can only upload 1 photo at a time. I ended up going back to blogger which now has a design feature so you can better customize the look and layout of your blog. Not quite making it from scratch but good if you don’t have a ton of time. Otherwise I think wordpress.org let’s you host your own site. Hey girlfriend! This post is awesome! I love all of the pictures and the pillow rocks! Great photos, glad you are blogging again. I will keep an eye out for the burrito place at Logan. I don’t know about your hosting question, but it just so happens I checked out a book from the library yesterday that is all about wordpress (it’s pretty recent; I was a bit hesitant given how fast things move on the internet, but hey, it’s just a library book). It seems like it might touch on your questions–it seems to cover wordpress.org v. wordpress.com as well. Of course, I’ve been really bad about blogging so maybe I should just focus on THAT! As for sewing, knitting, etc., it seems our blog has turned mainly into a food blog (because, you gotta eat, even if you have no time for anything else). Um, whoa that must have been quite a trip. Would love to hear about it in person. You are very inspiring Monet and wish we live closer so we could hang out! Love your pillow too, the colors are great. I’ve returned to blogging myself after a year long break. Planning on making it to the March meeting. See you there. Good luck with your blog.